Local football once again has entered tentative times with a plethora of ideas streaming in as the panacea for the present ills for this popular sport. Some veterans of the game has urged the Minister of Sports to replace the present administration of the Football Federation of Sri Lanka (FFSL) and appoint an Interim Committee (IC) to take football out of its misery. FFSL’s Ranjith Rodrigo claimed that ‘it’s not easy to walk the talk’ as some may claim. As the head of Media and Finance Committees of FFSL, Rodrigo, one of the targets of the football critics of the country, made early indications that he will run for the top position of Sri Lanka’s Football administration. Despite his enthusiasm to serve football, he has always been the ‘bulls eye’ and is sometimes compared to a former head of the FFSL who ran the show for years. “Up to date no one from the present FFSL administration, its Executive Committee or its Central Committee has complained against me. I head the Media and Finance Committees, which are the most responsible entities of FFSL. Except for highly important meetings or Executive Committee or Central Committee sittings, I seldom visit the Football House. So I do not think I should respond to baseless accusations or advocate against an IC. What we do here at FFSL is a thankless, voluntary job and I’m one of those individuals who is willing to run that extra mile despite all the criticism leveled,” Rodrigo told the Sunday Times. With the beginning of the new year, the focus of sports routinely moves towards elections or annual general meetings (AGMs), which are forthcoming. Sports governing bodies in Sri Lanka have not enjoyed a healthy reputation among its respective fraternities as well as with the general public and football is no exception. The reason behind football to be among the top in the ‘hated’ list in administration is at times confusing. Many in the fraternity just like Rodrigo, have shown their interest to get into the mainstream administration. Rodrigo went on to explain that it’s not easy to adopt to ‘democracy’ after being virtually ruled by ‘dictatorship’. “After the change of the FFSL hierarchy a few years ago, the operations have become democratic once again. So anyone, who thinks they meet the qualifications, can contest at the AGM. But whoever who comes should have sports ethics, to serve football and country. They should not be dependants of football and its perks. It’s common for all, including me,” he stressed. Pointing out the danger of FFSL being ruled by an IC, even for the short term, Rodrigo went on to say that everyone has the right to criticise, but he says it should be constructive. The FFSL recently called on former players with qualifications as volunteers to form a Technical Advisory Committee, but up to date according to Rodrigo, no one has shown any interest. 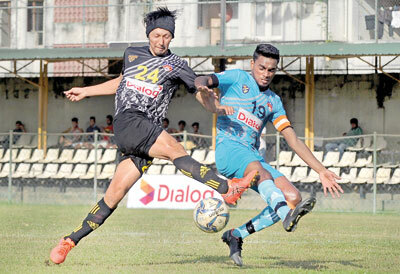 FFSL’s intention of forming a Technical Advisory Committee — mainly to promising younger players with national prospects as well as the present national players – after Sri Lanka’s dismal performance internationally, still remain a dream. “We as administrators respect former players, veterans and experts of football, but all what they say are not really workable. Some of their requirements are individually based and totally outdated. They must understand that with time the game of football too has changed, and so has the administrative structure. There are silent characters, who remain unseen and come out with innovative and productive ideas. Just because of a few rotten apples, the FFSL has not been able to obtain the expertise of such individuals,” he pointed out, while further explaining the global administrative practice. The present FFSL administration headed by Anura de Silva, too has been subjected to criticism by some in the fraternity and by now fractures within have emerged, showing their willingness to contest for the top position. Many are of the view that there still are ghouls of the past administration even prior to Rodrigo’s term as head of FFSL. “It’s not fair and ethical for some to be in the administrative structure and blame their successors just because they were rejected. If there are lapses, even today, they must remember that it’s because the former administrators did not leave good space and environment. If the incumbent set of officials are at the receiving end of the blame game, either they are always criticised because it’s the only thing best to do, or being sabotaged, or not being supported by those who blame. But there are some who go out of the way, spend their own wealth and earnings to maintain clubs and leagues. I’m proud to be one of them,” Rodrigo stressed. Is local Rugby top heavy and lopsided? National Sport or National Pastime, what exactly does ‘National’ mean, anyway?